Port d'Alcúdia is a coastal urban center of the municipality of Alcúdia, located in the northern part of the island of Mallorca. This municipality, which belongs to the region of Raiguer, limits with Pollença, Sa Pobla and Muro and has a total population of almost 20,000 inhabitants. One of the things that we most want to do when our holidays arrive is relaxing while sunbathing on the beach, and in Port d'Alcúdia we have a great variety of them to satisfy our desires, as we can find from extensive beaches of fine sand to small coves full of stones. Although it is difficult to choose between the fantastic beaches this place holds, we will choose two of them. The first is Playa de Alcanada, of a small size, pebbles and transparent water. With only 200 meters long and 20 meters wide, it is flanked by a pine forest that allows visitors to rest in the shade. In addition, just a hundred and fifty meters from the shore is the islet of Alcanada, in which a lighthouse rises that illuminates the sunrise and sunset, allowing visitors to contemplate a beautiful print that not everyone can see. In addition, the proximity of the islet allows people to swim. The other alternative we have chosen, this time much quieter, is a real wonder for beach lovers. We are talking about Coll Baix, one of the most beautiful rarities in Mallorca. To get there you have to walk a few kilometers along a path surrounded by pine trees and large stones. As you get closer to the end of the road, the spectacular landscape will open its way before your eyes. Coll Baix is a beach surrounded by imposing vertical stone walls, which are slightly larger than the previous but much quieter. You will be able to feel in harmony with the land and the sea lying in the thick sand of this beach while you contemplate its deep turquoise waters, where it is common to see small boats anchored. The traditional Mediterranean gastronomy of the Balearic Islands, varied and appetizing, is comprised of a wide range of products from both the land and the sea. In the different restaurants of Port d'Alcúdia, they prepare the most delicious dishes of the territory. If you want to enjoy the fresh fish of the area, a good option may be the salmonete frito, which accompanied by a coca de verduras and a couple of glasses of white wine, will leave you totally satisfied. As for the meat dishes, the lamb or roast goat is typical of the island, as well as the great variety of native sausages, such as the famous sobrasada or camaiot, less renowned but with the same intensity of flavor. 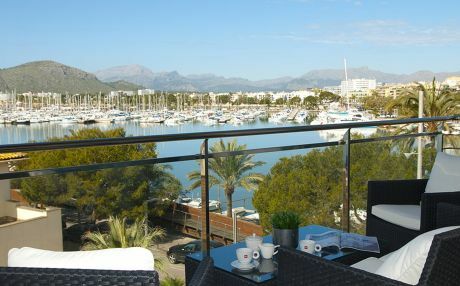 Port d'Alcúdia is one of the most touristic urban centers of this population, given its proximity to the wonderful beaches of Alcudia and Parque Natural de s'Albufera. 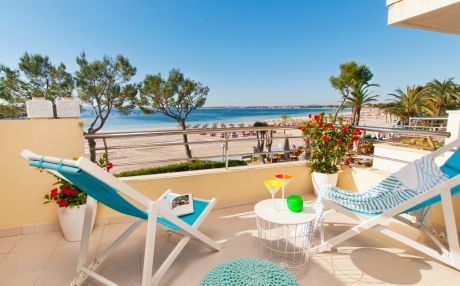 It has a wide rental accommodation offer, along with an important network of amenities such as restaurants, shops, sports centers and golf courses. What your children will surely enjoy the most is the beach. The little ones love the sand and the water in summer, and they will love to bury themselves or to build castles and channels where water passes when the waves rise. But this is not all you can do in Port d'Alcúdia with your children. If they like the sea and water games, they will surely be fascinated if you take them to Hidropark, a water park located in the town where you can enjoy slides, wave pools and play areas. If you prefer to have fun with them without getting wet, go to the mini golf area of the park, where the little ones can get introduced to this sport. A nice trip is Puig de la Victoria, which along with other smaller elevations form a small and beautiful peninsula that separates the bays of Pollença and Alcúdia. Another area worthy of visiting is the Puig de Sant Martí, where numerous excursions are organized on foot, by bicycle and even on horseback. If you are brave and want to enjoy spectacular views of the Natural Park and the Mediterranean Sea, you can climb to the top of the mountain to make paragliding or hang gliding. Another beautiful spot in this mountain is Cueva de Sant Martí, in which inhabit two species of protected bats. In addition to these unforgettable coasts, four kilometers from Port de Alcúdia is Parque Natural de s'Albufera and, in the same municipality, there are several protected areas with lots of natural features. All this gives visitors the privilege of being surrounded by a great wealth of ecosystems, an important number of bird species and an extensive floral variety near their holiday apartment. 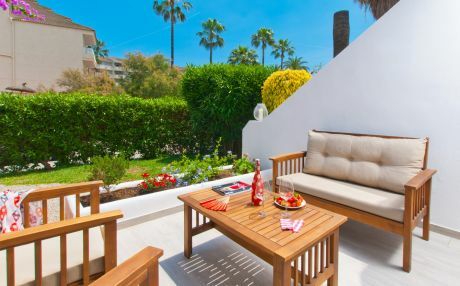 Once you have everything prepared for your holidays, you just need to find the perfect rental apartment. The journey from the peninsula to the island will be surely done by plane, although it’s also possible to arrive by sea. Whatever option you choose, your first steps on the island will be in the city of Palma de Mallorca. 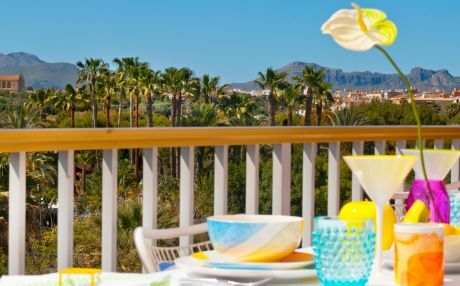 From there, you will move to Port d'Alcúdia. Your first alternative is to use public transport. To do this, go to the Intermodal Station of Palma, where you will find the bus number 351, which will take you to your destination in about an hour and a quarter. If you prefer to go by car, to get to Port d'Alcúdia you have to take the Ma-13 and drive for about fifty minutes. Once there, you only have to unpack and begin your vacations. You have looked for the most beautiful landscapes, the quietest beach and the most select restaurants for your holidays. Now, to get the complete lot, you need to find the most comfortable and pleasant accommodation possible, the one that suits all your needs. At TripKay, we specialize in getting the best apartment for each client. We carefully study their requests one by one and to help them choose the accommodation that best suits their needs. We work with top suppliers and offer the best rental apartments. Contact TripKay to find the ideal accommodation for your vacation.